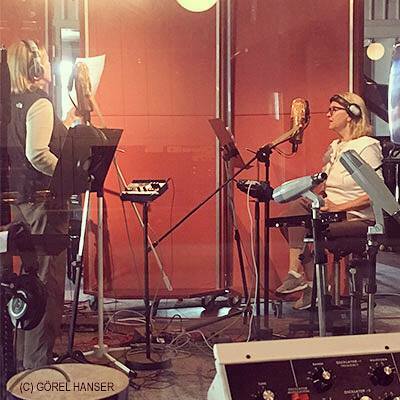 In June 2017, the four members of ABBA went into the studio again to record two new ABBA-songs for an upcoming TV-special where their digital avatars will perform one of the new songs, "I Still Have Faith In You" (the other being called "Don't Shut Me Down"). Above is a photo of Frida and Agnetha in the studio. Below is the official announcement in April 2018. The songs and the TV-special have been delayed. No release date yet, but most likely sometime during 2019. Back in the late 70s I became a fan of the pop group ABBA. But it wasn't until 1983 that I became a fan of Agnetha Fältskog as a solo artist. I was a teenager and began collecting pictures and articles from magazines and newspapers. Throughout the years I've managed to collect more than two scrapbooks worth of material. The main reason why I wanted to create this website was to share the material I have with other fans. I have a lot of photos from magazines and newspapers. But I also wanted fans around the world to get to know a little bit more about Agnetha as a person. During her days in ABBA, fans outside Sweden didn't hear her talk very much. It was mainly Björn and Benny who did the talking. 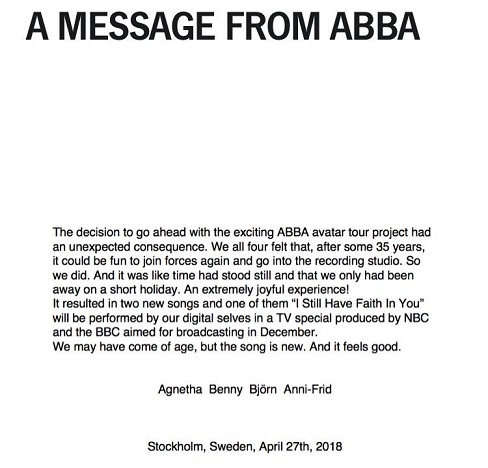 So that's why I've translated Swedish interviews with Agnetha and I will continue uploading them as long as I have more to translate. It has now been 14 years since this site appeared online and I hope it has brought some joy to those of you who have visited it. On October 8, 2008, Sony BMG Music Entertainment Sweden released a new 2 CD-collection of Agnetha's favorite songs throughout her career. It's a nice collection and Agnetha even wrote a foreword in the CD-booklet. As far as I know the CD has only been released in Sweden but if you live outside Sweden, you can order it from ABBA's official website. The CD has been released in a jewel case and a digi-pack. To order the CD, go to http://shop.abbathemuseum.com/ and there you'll find it. Agnetha receives a lot of mail so there's no guarantee that you'll recieve a reply, but good luck. Here's a banner you can use on your website if you want to provide a link to my site.